Hearing the national debate about the growth of fast food outlets in UAE, I can once again tell you that we've been through it all in the United Kingdom. Poor diet can be a major factor in the symptoms of stress and depression and I have to admit that it is the one I have had the most trouble resolving with my stress counselling clients. When it comes to sensible sleeping habits, my advice is usually heeded. And I have had plenty of success in encouraging clients to take regular exercise. But trying to instil good eating habits in people, is the most frustrating of all and the increase in fast food consumption could be a key factor. I once worked closely with the HR department on stress counselling issues with a prestigious aircraft design group who were having to relocate, and I accompanied the directors when they visited their choice of two new office buildings. One of them had no exercise facilities, but the other was equipped with an award-winning executive gym. I noted with satisfaction that the new office accommodation also had a good staff canteen, with a dietician who took the trouble to organise healthy, low-cost menus. Yet the employees just seemed to prefer drifting off to the takeaways. The explanation for this is not easy to ascertain, but is probably to do with the instant taste gratification of fats and sugar. It reminded me of watching London school-children hanging around outside takeaway outlets every day after lessons. With bad habits setting-up so early in life, no wonder they could end up suffering obesity and poor health later. And it is truly annoying to hear people identify takeaway fast-food as of benefit for those on low or fixed incomes. In terms of nutrition per dirham, it is probably the opposite. I believe that bad time management together with unrealistic work schedules may be partly to blame for the link between fast-food and stress. Towards the middle of a busy working day, a certain "urgency momentum" has built up, and it becomes difficult to change your work rhythm to take a relaxed hour for a proper sit-down lunch. Your mind is still on that screen, with its urgent e-mails and the jobs you have still to complete before the day is finished. Your stomach may need food but your mind is still on duty! In this atmosphere, lunch becomes just another item on the agenda, to be completed as quickly as possible. 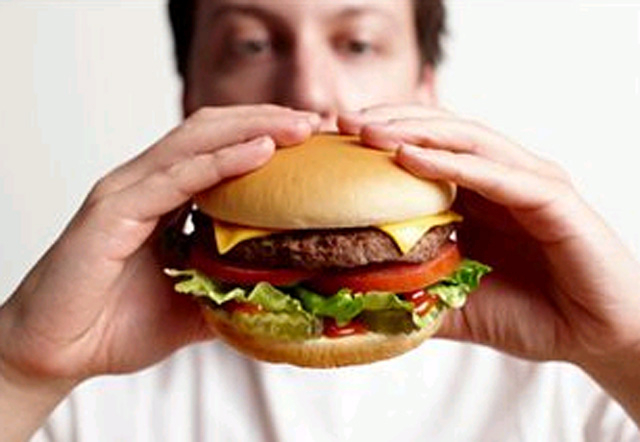 So the fast-food habit may stem from one kind of stressor — bad time management. But it goes on to cause another of the classic symptoms of stress. The headaches and lack of energy, particularly in the afternoon that can result from poor nutrition, and the failure to relax and recharge.